Follow these expert tips to have a better shopping experience for yourself and the environment. Lauren Singer is a presenter at Wanderlust Hollywood and Wanderlust Festivals. For more information, click here. 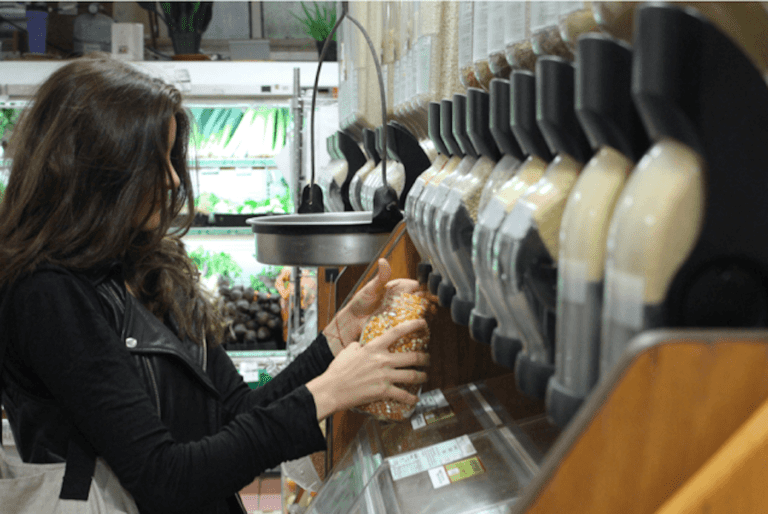 When Lauren Singer goes food shopping, the people behind the counter already know she’s the one who’s going to insist on using her own reusable containers. “They know me now,” says Lauren. “When I go to buy things now they already know that I don’t want packaging. 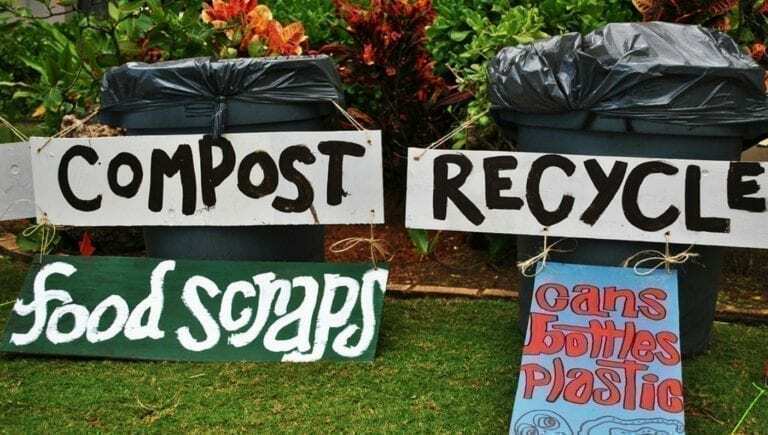 It’s just a nice relationship to have.” It’s a win-win when you can develop a relationship with people you buy groceries from, while improving your relationship with the Earth, and advocating for zero waste practices. There’s unnecessary trash all around us in our everyday live. The road to a zero-waste life wasn’t always easy, but Lauren made it work. Which just goes to show, going zero-waste is not as impossible as it sounds. One of the easiest ways to reduce your personal waste is at the grocery store. We sat down with Lauren to figure out how to go grocery shopping waste-free. Lauren was never really a fan of typical grocery stores, so seeking out new places to get her produce was a win-win. “I love farmers markets. They just make me happier,” she explains. 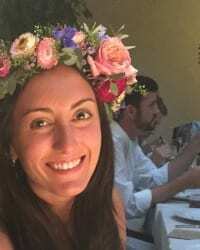 “I’m a big believer in doing things that make me feel good, and grocery stores just never made me feel good.” By shopping at local markets Lauren supports area farmers, gets fresh, quality produce, and—since most things at farmers markets aren’t prepackaged—she can more easily shop zero waste. “First, before anything else, see if you have any local farmers markets or natural food stores. I believe in always trying to support your local economy. Big box stores should be a last resort,” she says. Of course, for some, farmers markets and natural food stores may not be easily accessible, if accessible at all. While you may wish you could avoid them altogether, local grocery stores and big box stores could be your only option. We can all only do what we can. Make an effort to stop at farmers markets on the weekends if possible, and just remember that every little bit counts. Regardless of your situation, there’s plenty you can do when shopping to help you transition into a less wasteful way of life without jumping too far outside your comfort zone. An easy way to cut down on waste when grocery shopping is to BYOC—bring your own containers! In 2014, California became the first state to ban all plastic bags at retail stores, and other states and locales have followed suit by charging minimal fees for plastic bags at checkouts etc. So no more plastic bags. If you have a ton of bags at home—which you more than likely do—Lauren suggests taking them to a local grocery store that has a plastic bag take-back bin (if you can’t find one, inquire with a store manager). Unsure if you can make an impact? According to the Natural Resources Defense Council: “The average American family takes home 1,500 plastic bags a year.” That’s a lot of plastic. Keep reusable bags and containers in a desk drawer, around your home, and in your car to make zero waste shopping convenient day or night. It doesn’t stop with bags. Reusable containers are key for produce. Can you use your own mason jars or bags to collect products such as peanut butter, granola, or nuts? Bring your own cloth bags for lettuce and loose vegetables. Next up? A shopping list. “When you make a shopping list you’ll know how many bags you will need. Usually, when you don’t make a shopping list you wind up getting stuff that you don’t need, and that’s typically wasteful,” Lauren says. Plan ahead and be prepared. Look for recyclable packaging—always avoid plastic. Opt for paper packaging first. Cardboard packaging is a good secondary option to paper that is both sustainable, and compostable. Choose products packaged in recyclable materials—aluminum cans, or glass. Lauren also suggests buying products in larger quantities. Not only will they last longer, but products in larger quantities—like olive oil, for instance—are often found to be in more sustainable packaging, like glass bottles, rather than flexible plastic. Of course it’s ideal if you can buy products from bins using your own reusable containers and skipping packaging altogether. But these options aren’t always available for all products—or at all, depending on where you live. So at least there are some simple, mindful tweaks you can make to your grocery shopping routine to be kinder to the Earth. “There are always options, you just have to ask for what you want,” Lauren says. “We’re the ones spending money… Which is important to remember. We’re the ones giving these stores our business. They should be accommodating to us. We forget that, we think, ‘Oh, well, a store is not going to change for me.’ ” But our dollar can make an impact. Grocery shopping zero waste offers you an opportunity to use your voice, spread the word, and build relationships with others. In most supermarkets and big box stores, asking for produce sans packaging may be an unusual request. “It’s all about relationships,” Lauren says, “give a little backstory, explain to people why you’re doing what you’re doing.” It can make a difference, and that impact could have a ripple effect. If you’re heading to an in-store bakery or butcher with your own container in hand, be ready to speak up. Offer your container with an explanation, something like: “I’m trying really hard to not make any trash, I know this might be weird, but I would really appreciate it if you could try to use my container for this meat—or cheese, bread, etc.—instead of wrapping it in plastic,” Lauren suggests. When you share your story you’re opening other’s eyes to options they may not have been aware of, while also building relationships. Styrofoam, single-use disposables (like straws), paper towels, napkins, produce stickers, and flexible plastic packaging are all at the top of Lauren’s list of things to avoid when grocery shopping. Store-bought products that you can easily make yourself are on this list as well (items like cleaning products, laundry detergent, toothpaste, and deodorant, to name a few). We live in a wasteful world. Americans alone generate more than 250 million tons of trash every year, about 4.4 pounds of trash per person per day. Imagine how different things would be—how much less literal junk we’d be living with—if every person made a commitment to shrink this. Having found a good formula for Zero Waste living, all the trash Lauren now generates in a full year will fit into a single mason jar. That’s a far cry from 4.4 pounds per day! Lauren has allowed herself to become aware of, and very familiar with, the trash she produces by keeping her trash in a mason jar. Things that you wouldn’t ordinarily take much notice of suddenly come into the spotlight when your trash is on display. Take produce stickers, for instance. “How often do you think of produce stickers?” Lauren asks. “Never.” But when you’re keeping tabs on your trash, you’re much more likely to identify the little things you’d otherwise miss. “I do like collecting [in the trash jar], because I think it just sheds light on a problem, and then you’re more likely to effectively solve it,” she says. Imagine if every person made a commitment to make virtually no trash every year. What would it do for our resources? What would the ocean look like? How could we change our planet? The more we learn about our environment, and what we can do to protect it, the less excuses we have to continue to harm it. Have you tried zero waste grocery shopping? How did it go? Share in the comments below.